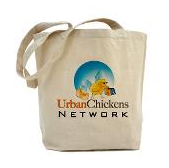 This little gem about how keeping your own urban chickens means truly knowing where your food comes from is just one of the great soundbites from the wonderful two-part video interview of the "Toronto Chicken Lady" posted by David Sheen over on the Green Apple Landscaping blog. The video interview is a followup to his earlier post on Backyard Chickens. Since chickens are still illegal in the Toronto's residential neighbourhoods, the interview subject's identity is obscured, but that doesn't hinder her from sharing tons of urban chicken wisdom from the ins-and-outs of daily urban chicken keeping to all the benefits that come from keeping hens in your backyard. If you're thinking about keeping chickens in your own backyard (or trying to convince your partner that it's a good idea, really! ), you could do a lot worse than spending 15 minutes listening to the Toronto Chicken Lady talking about the benefits of raising your own hens. I notice that she's got a partial list on her Toronto Chickens site of places where chickens are legal. It's no surprise that there are so many more places where they're legal in the USA than in Canada, but wow, you'd think our neighbors up north would be a bit more progressive on this front. And you've heard it before, and I'll say it again: I've started to compile a list of the exact ordinances making chickens legal over on the Urban Chickens Network Legal Resource Center where visitors can easily see the technical language employed by cities to legalize chickens. If you live in a place where chickens are legal, please add your city's name to the list so we can capture the municipal code and flesh out the resource center. Thanks!